Hey guys! This week at The Greeting Farm Blog you get a sneaky peaky of the March Release available on the 1st. You will not be disappointed. Check out the cute samples that the Guest Designers have made. Also you have a chance to win the new releases, for more info go to the blog. Happy Sunday! 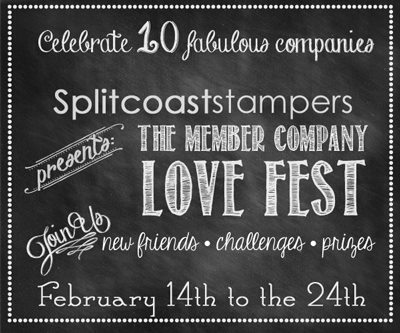 Today over at Splitcoast Stampers we, The Greeting Farm, is participating in The Member Company "LOVE FEST". Our turn is up and our challenge for you is "A Love to DIE for", which translates to use dies in your project. Here is the card I created just for this event. I am using the new digi Valentine Anya. The die aspect of the card is the Mini Clouds w/Die set. I first cut out the cloud shape using scrap paper. I used it as a mask when creating the clouds in the background. I then cut the clouds out of vellum paper and used a polka dotted embossing folder to add texture to the clouds. They turned out so cute! The mini cloud image with the heart is also from that stamp/die set. I used the negative scrap of the corrugated cardboard from a previous project to frame the background. The sentiment is embossed with white embossing powder. Valentine Anya is colored with my Copic markers and I added some red Stickles to her bow and heart. When you get a chance, come on over to SCS and check out the other projects by our Designers. Enjoy the rest of your weekend! Talk to ya soon. HELLO Friday, finally! I fell in lovey love love with the new stamp/die set Mini Clouds from The Greeting Farm, so I had to use them again in this Farm Fresh Friday's Challenge. The challenge is Flowers. I used flowers in my designer paper in the background, the paper flower embellishments and also in the Lovey Bean image. She's fluttering around up in the clouds and welcoming Spring =) I added some rhinestones to her hair and also on the clothespin. The image is colored with my Copic markers and I added some Stickles to her wings for some sparkle. Please come and join us for this FFF challenge. GOOD LUCK to all! Have a fabulous weekend everyone! Good morning! Okay how exciting was that new release from The Greeting Farm! I wouldn't be surprised if we were out of stock already lol. Well aside from those new sets, today is Double Take Tuesday over at the TGF Blog. Here is my contribution to this challenge using Awareness Anya. I wanted her face to be the main focus of the image, so i created a mask for her face and used my Lindy's Stamp Gang sprays all over the image. When I peeled off the mask (thank goodness it didn't leak under) I then colored her face with my Copic markers. I loved the effect that it gave. I wanted my background to match so I then used the same color sprays and created my own pattern paper. One particular spray had this beautiful gold shimmer to it that I love. I hope you guys try this technique, it's different but a lot of FUN! Here is the fabulous sketch for this challenge if you guys want to play along. I added some I Am Roses flowers and for the leaves, I used the Mini Fleurs w/Die stamp set. This is as close as I get to mix media LOL, I'm a chicken when it comes to making all that mess and mixing stuff! So there is my card for you today. Supplies listed below and thanks for stopping by! Happy Friday! They're here! You got a sneek peak now here they are! The Greeting Farm is moving in a NEW direction, and we are so excited to unveil what you may have seen bits and pieces of after CHA! Yes, the rumors are true! While TGF will still continue to bring you the cute characters you've come to know and love, I'm excited to share a new collection of clear stamp sets that come packaged with....drumroll..(you already know lol) MATCHING DIES! TGF took it's time testing them until they found the perfect fir and we think you will love them. I do! They will work in any standard die cutting machine (Cuttlebug, Big Shot, Granc Calibur, etc.) and come tucked in with their matching stamp set for an amazing price of only $10.50 per set! Your papercrafting adventure just got a little more exciting, right? The possibilities are endless and you'll see just what we're talking about when you hop with us today! To celebrate this exciting news, The Greeting Farm is welcoming SIX talented guest bloggers to our party today and we couldn't be more excited to have them with us! So have you picked your favorite? They are all so fun and cute to play with. Be sure to stop by The Greeting Farm's blog once you complete the hop and enter for your chance to win ALL FOUR new stamp/die sets! We cannot wait to see all of the super creative ways you are going to be able to use these new sets and will keep this contest open until NOON CST tomorrow. So grab some snacks and have fun getting inspired on our hop and enjoy our new release that is simply to "Die" for! Also today's Farm Fresh Friday Challenge is to use the new stamps/dies in your project. Once you receive them you'll want to play right away! Hey guys here's an exciting sneak peek of one of the upcoming new releases for tomorrow. GASP, what no character?? Not this time. I am showing a new stamp set that comes with a coordinating DIE! Say what?! Head on over to The Greeting Farm blog to see the entire release and for your chance to win one set of your choice. Plus you will see all the other projects created by the Design Team members. This particular set is the Mini Fleurs w/die. It comes with seven images including a sentiment, a total of eight stamps. I got to play around with several color combos to perfectly match my designer paper and I used the coordinating flower die along with it. Here is my finished card. The wafer thin die can be used in your Cuttlebug, Big Shot, basically any machine that is compatible to cut the thin metal wafer dies. For me, I used my Cuttlebug. The die cuts just the perfect amount of border around the stamped image. I hope you guys are excited about this new release as much as I am. Don't forget to go to the TGF Blog to enter for a chance to win one set of your choice. Eeeeeeeeeee (that's me squealing). Stay tuned for the awesome New Release Blog Hop (Friday the 15th). You can have the chance to win the entire special release! Woohoo! Bye for now and see ya later! Hello Wednesday! I promised you another project and here it is. It's a Retro-Fresh Challenge over at The Greeting Farm today. You must use a stamp/image that is at least 6 months or more older. The theme for this challenge are hearts. I chose to use Cheeky Rockabilly, love her, and Flutter Heart Clear Stamp. The background of the falling hearts are from that clear stamp set. I had so much fun coloring her, I always have fun coloring. I stamped the hearts in the background and the image as a whole didn't feel complete. For some odd reason I decided to try to draw some sort of platform/stand for her to sit on. It wasn't a main focus so I like how it's not in your face "look at me I'm a stand" LOL. I tried my best on the shading part and that's how it turned out. I added some of my favorite heart pillow stickers and a XOXO to the card. That is my card for today. There's something new and exciting to share with you guys Thursday! You won't be disappointed. See ya tomorrow! Good morning! This week is going to be jammed packed with projects so stay tuned. Today is Double-Take Tuesday at The Greeting Farm. 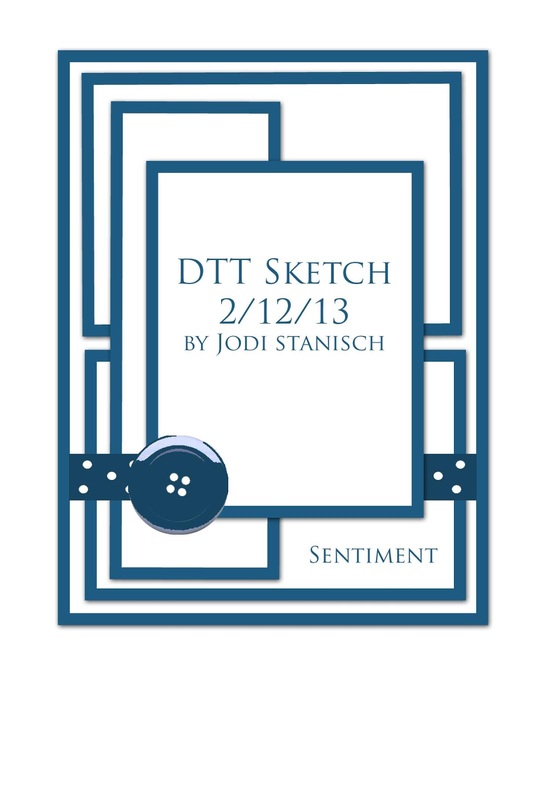 Come and play along this week, the challenge is this sketch designed by fellow designer Jodi. The sketch is awesome. Here is my card using Sitting Wonderful. The paper I used is from Authentique - Uncommon. Love the grays and pinks in this paper pad. I paper pieced the couch on some striped pattern paper and colored her with my Copic markers. I added some lace trim and fussy cut some roses out of the pattern paper. On top of the roses, I added some Fruit Punch Stickles. The "hello" sentiment on the bottom corner are from some tiny alpha stickers I had on hand. Check out the other creations from the other designers at the TGF Blog. Play along with us for your chance to win a free image. GOOD LUCK!! Come back tomorrow for another project! If you look closely at the image (WS Gracie), it looks a little bit different. You notice anything missing? I'll tell you, it's the lines on the stamp. I tried this technique called "No-Border" technique. You basically use a lighter ink pad to stamp the image, so that you don't have those harsh lines. I used Memento Desert Sand. After that you use a fine point pen to go over her eyes and eyebrows. Then you very carefully color her in. This image took me longer than usual. This was my 2nd attempt because I had messed up on her face, I colored in the lips and she looked like she just had botox LOL. I had so much fun with this new way of coloring. The image has more of a softer look. Anyways, back to the challenge. For the buttons, I had these heart shaped buttons and I ran some red/white bakers twine through the holes. I also wrapped it around the matted cardstock before laying it on the base of the card. I will try my best to get a video out on how I colored this image or something similar using this "no-border" technique. I hope you guys can play along for this FFF challenge. Have a crafty weekend! Hello hello! It's Tuesday and you know what that means, it's Double-Take Tuesdays over at The Greeting Farm. Head on over there for more details. Today is a color challenge of pink, white and blue. The card I made is using Awareness Anya. I took a break in making Valentine's Day cards. I busted out some old MME glitter paper ( I need to use my paper stash!). I didn't want to use a dark blue color so I chose papers that were more of a pastel, shabby tone. I used this beautiful pink rosette/pearl trim and this blue lace trim from my stash. She of course is colored with my Copic markers and I covered her ribbon with some Stickles to make it pop. Okay that's my card for you and I hope that you liked it. 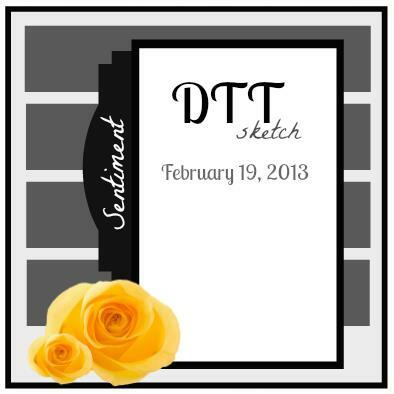 Please come and join in on this week's DTT. Good Morning! It is our very first 2013 Color Challenge over at the I Am Roses Challenge Blog. Be sure to check it out for all the rules/details for your chance to win some I Am Roses yummies. Here is the Valentine's Day card I created for the challenge. I had this leftover image from an old K&Co Valentine's Day paper collection. I used different sizes of I Am Roses flowers ranging from .5"-2". I also used some Daisy Leaves. I inserted some twine loops in the bottom floral arrangement and tied a bow at the top corner. I added some pearl/crochet trim from Recollections. I hope you guys enter the color challenge and can't wait to see all of your creations. Thanks for stopping by. Hope everyone is having a great weekend so far. I wanted to share this card that I made for a challenge over at MyScrapRoom.ning.com. There was a long list of requirements but I was able to get them all in this card. I actually killed two birds with one stone because this is also going to be my Valentine's Day card to my hubby. Perfect! I had so much fun creating this Three Fold Card, tutorial can be found here. Really easy. Here's just a wuick video of my card here. The two images that I used are from The Greeting Farm (Oh Boy! Ian & Sitting Wonderful). Inside the card I created this "polaroid" picture of myself & hubby. I know he'll love it, he's my #1 fan!